Huawei just announced their official partnership with Smart Communications (Philippines) and as part of their early Christmas treat for everyone, they offer Huawei Ascend G610 with Smart postpaid. The handset cost you only 800 pesos per month plus a fully customizable network services bundles. Huawei Ascend G610 has a 5-inch screen display on a 540x960 resolution with a dual cellular network capability. Only one slot supports 3G/HSDPA and the secondary only SIM can still handle GPRS to EDGE connection type. Also offered free on other Smart Postpaid plan denominations starting from Plan 500, 1200 up to 2500. To those who want to get a larger and smarter phone at a very affordable plan price you can go visit your nearest Smart Wireless Center to inquire about Ascend G610. First goods you can get with this phone is the screen display, large enough to swipe and type to those who uses this phone for business purposes. Reading emails, browsing files, storage, calling and texting and even for internet app usage like Facebook, Twitter and more all can be manage on this device. Battery power is also one of the most important and what users want looking at as most newly release phones comes only with a less power time. Having a 2150 mAh is good enough for a qHD phone with 5 inch display size, this may last 24 hours or more depending on your usage. 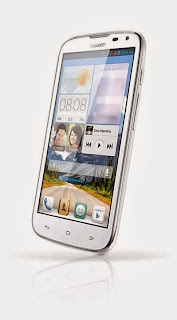 All in all this is a worth to buy phone, Smart haven’t announce yet the price of Huawei Ascend G610 via prepaid kit. Hopefully on the next few days they post the price on this.